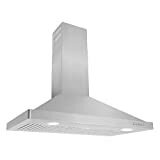 Remodel your entire kitchen with Cosmo’s modern canopy wall mount range hood. 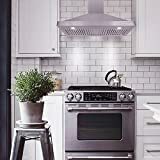 Experience premium brushed stainless steel built to withstand high heat, grease, oil, and steam. 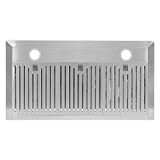 Thick stainless is used all around to fight against accidental bumps and dents. Our included chimney set is seamless on all three sides for cleaner lines.Cook without unwanted odors and harmful air pollutants from disturbing your home. Contemporary styling is used for modern kitchen decors and an upscale luxury feel. Trust Cosmo for your next kitchen appliance. 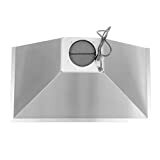 • Wall mount canopy hood designed with modern contemporary styling. • 760 cu. ft. per minute, 3 speed motor with 65 decibel max noise. • Premium stainless steel filters, dishwasher-safe, and to easy to clean body. 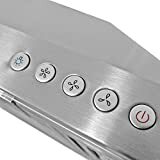 • Push button controls, high lumen energy efficient lighting OR Touch controls with back lit display, high lumen energy efficient lighting. • Industry leading 5 year manufacturers parts warranty. 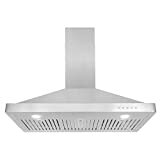 HIGH AIRFLOW ULTRA-QUIET DESIGN : Features 36 inch size, 760 CFM . 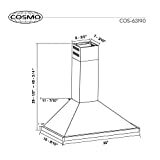 Cosmo's wall mount range-hood quickly ventilates your kitchen without the loudness and sounds of competing range hoods. 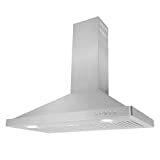 Interested in the Cosmo 63190 36-in Wall-Mount Range Hood 760-CFM | Ducted / Ductless Convertible Duct , Kitchen Chimney-Style Over Stove Vent LED Light , 3 Speed Exhaust Fan , Permanent Filter ( Stainless Steel )? Is the price too high? You can easily price watch this product and we'll notify you when the price reaches your target.